Today the Care4Calais team travelled to Brussels to distribute essential items to the hundreds of refugees who are currently living there. Thanks to your donations, we were able to supply them with warm coats, durable backpacks, power banks, and some food and water to support them through the bitter cold winter in Belgium. The items were gratefully received by refugees, but they were also happy to have someone smile and say “hello” instead of walking by as if they weren’t there. During our distribution a local family arrived with a car full of homemade goody bags and some pictures that the children had drawn for the refugees. The refugees spirits were lifted instantly and their hearts warmed as they smiled and cheered when the young local children handed out their heartfelt gifts. We met refugees from many countries, including Barak (pictured) who fled the conflict and abject poverty of Sudan which has claimed the lives of tens of thousands of people following decades of civil unrest. He left his life, his family and friends behind to come to Europe in desperate hope of safer future. 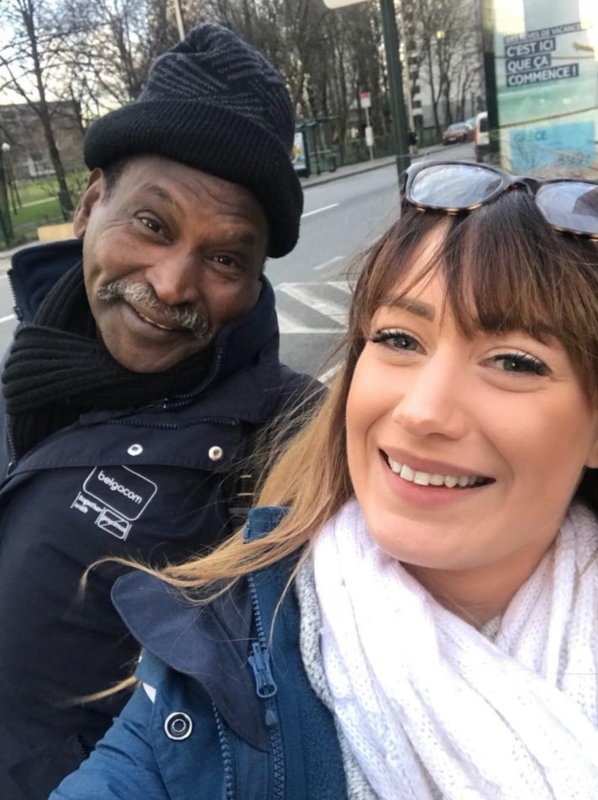 Despite the turmoil Barak has experienced his life, and the treacherous conditions that he continues to live in, Barak continues to be a happy and lively individual who lifted our spirits instantly as he sneaked into this photograph with a volunteer. As the distribution continued, the volume of refugees coming for aid continued to increase. It is a surreal and heart wrenching sight to see hundreds of people gather in desperate need of such basic items. Whilst the distribution was successful, it is not enough. After they collected their items, the refugees returned to the streets of Brussels to wait out yet another night of cold, hunger, and uncertainty over their fate and future.